Jason wakes on the back seat of a school bus with no memory. He is told Leo is his best friend and Piper is is girlfriend but he just can’t remember. Before he can get his bearings all hell breaks loose. They are attacked by monsters, protected by a satyr and Jason is able to do things that seem totally unreal. 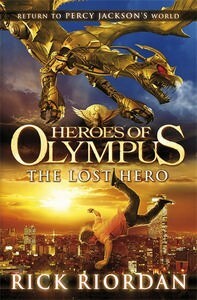 Jason, Leo and Piper are rescued only to crash land at Camp Half-Blood. Apparently it’s the only safe place for the children of the Greek gods. It doesn’t really appear all that safe, apart from the roaming monsters there are rumours of a terrible curse and a missing hero. Then somehow the three of them are chosen to undertake a terrifying new quest. They have no idea what must be done or what they must sacrifice to succeed. And what is Jason’s secret? How does he know the things he does? A very fitting installment in the world of Percy Jackson and it would probably be best if you have read the Percy Jackson books. A much bigger book but a no less riveting read. Told from three perspectives it keeps you interested and intrigued. As always there is plenty of action. Rick Riordan has produced another book I struggled to put down, even when my kids were demanding my attention. Please note the cover image I am showing is the one on Australian booksellers shelves not the international cover available on-line.